In honor of St. Patrick's Day, I thought I'd be pretty uncreative and pull together some of my favorite green rooms. I'm always a fan of bright, monochromatic (or dichromatic) spaces and green is one of my favorite colors when you're trying to go bright and bold, but still have a "liveable" room. 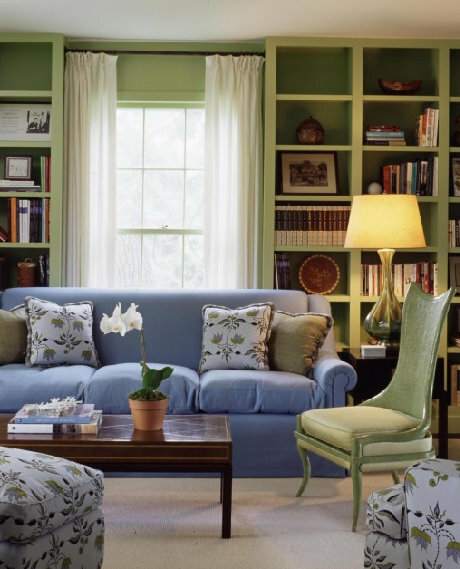 Unlike, say, orange or yellow, Green -- and even bold greens like kelly green -- read as a neutral when they stand alone or when only paired with true neutrals like white or black. I've been coveting these Ava dining chairs from Annie Selke for months. I also love how Amanda carried the green onto the heavy beams, creating a real architectural feature out of what could otherwise best be described as bulkheads. I also love the soft brass fixtures with the green, the warmth lends a richness and depth to the room that I don't think nickel or silver could. 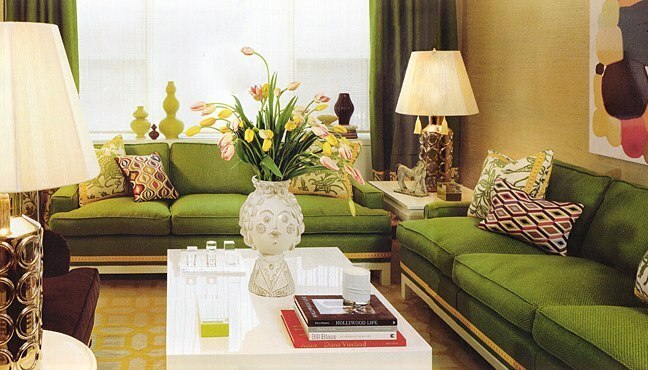 With its cheerful color palette and midcentury touches, this room is classic Jonathan Adler. 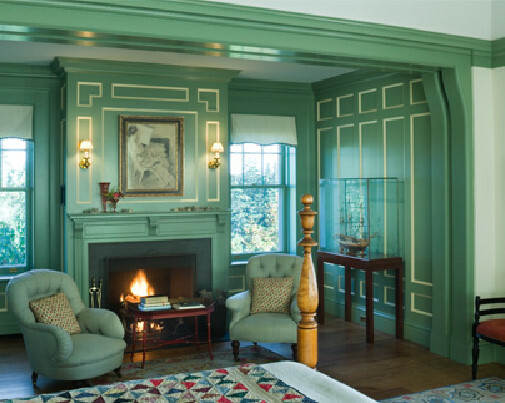 This room feels classic New England to me, with the roaring fire, heavy moldings and quilt on the bed. The color, however, really pulls it into the 21st century. I don't know if you'd call this color a blue-green or a green-blue, but I love it. I typically try to avoid competing shades of a single color in a room, but the lime green walls and turquoise chairs really works together here. 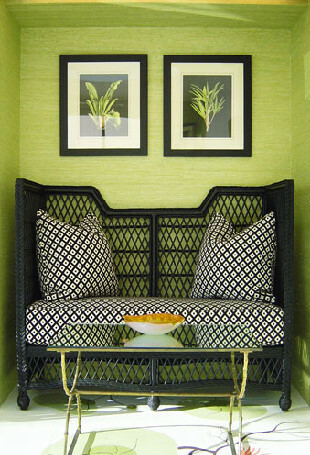 The overall effect is updated Palm Beach, without the hyper-coordination that can often make a room feel stuffy. Ah, another set of dining chairs that I'd love to own for myself -- anyone know the source on these? All the major elements in this room are neutral, but the room feels very colorful thanks to the green curtains, seat cushions and plates. In a few years the owner could easily switch these elements out with a different color for an entirely different look. It just goes to show you that you don't need a lot of color to make a big impact. The mix of modern and traditional elements in this room is wonderful, but the best feature by far is all that gorgeous natural light streaming in from the floor-to-ceiling window. I think I'm increasingly obsessed with grass cloth -- if only I could find a place to use it in my own house! In any case, I love the mix of patterns in this room. The graphic rug, the cheetah print chairs and the grasscloth on the walls all lend different but subtle patterns, the combination of which is really greater than the sum of its parts. Using a great print as a jumping off point for a room is a sure-fire way to achieve a cohesive design. 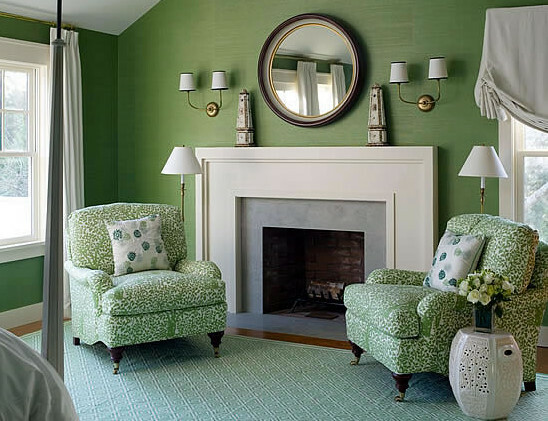 The lavender and lime color palette is pulled from the fabric used on the ottoman and side chair in the foreground. The fabric is then repeated in the pillows on the sofa, ensuring a balance between both sides of the room (after all, it would feel a bit "off" if all the print were on one side of the coffee table and all the solid fabrics were on the other). These forest green leather doors with brass nailhead trim make me realize that my hollow-core doors are such a missed design opportunity. I also like how the hallway stands on its own design-wise, yet still works with the adjoining entry as it picks up on the greens in the wallcovering and generally harmonizes with the browns that dominate the adjoining space. I love the tight brown and lime color palette in this room -- it really enabled John to mix prints with abandon: plaid, Ikat, butterflies, geometrics...and yet it all harmonizes beautifully because all the prints contain the same colors (and when they don't, like in the plaid and Ikat prints, Willey added the missing color in as trim). I normally shy away from floral or butterfly prints as too girly, but the color palette and the great mix of other prints makes this room feel gender neutral to me. Also, did you notice the trim on the ceiling? What a great (and inexpensive) way to bring some interest to your fifth wall! 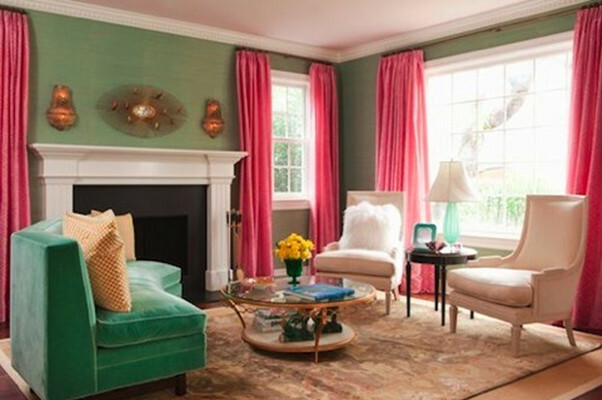 Pink and green is such a classic, preppy color combination, but it's one that never fails to make me happy. It's even better when the colors are turned up a notch as with the hot pink drapes here. 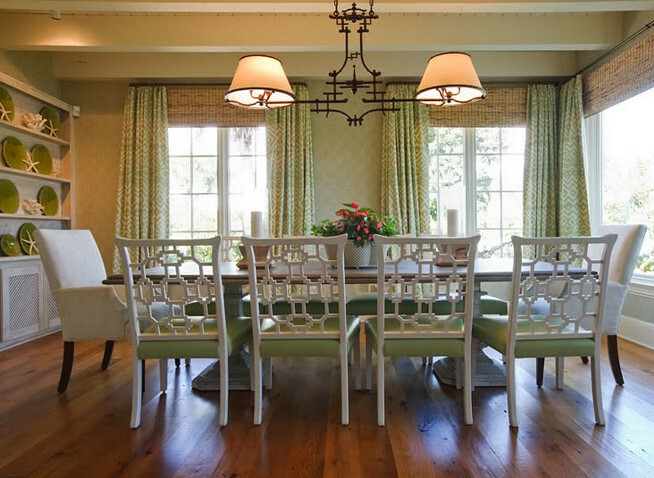 The softer neutrals in the rug and chairs help the room from feeling too much like the inside of a Lily Pulitzer store. I will say though that the composition feels a bit unbalanced to me, as all the saturated color in the green sofa and yellow pillows isn't set off by anything. I'd perhaps have included brighter pillows on the neutral side chairs and the white flokati pillows on the sofa...but that's just me. More fabulous pink and green, but this time both the pink and the green are in bold, saturated shades. I particularly love the contrast of the modern pop art with the very traditional handpainted wallpaper. Such a great contrast really makes this room stand out for me. 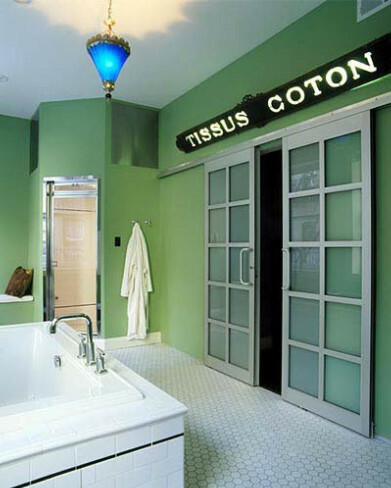 As much as I love a serene bathroom, I can't deny that this bright green bathroom from Sixx Designs is tons of fun. The salvaged pharmacy sign is a great touch and picks up on the retro black and white tiling. I really love the strong blue of the pendant light fixture. It's an unexpected, but brilliant touch in this room. Tobi is definitely a designer after my own heart. 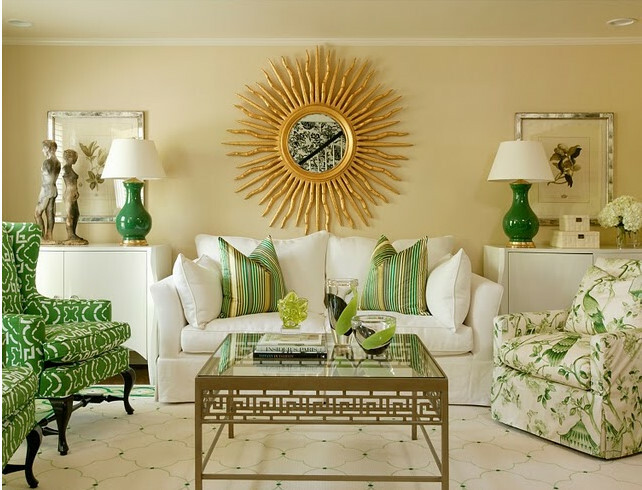 She's fundamentally traditional, but she's fond of bold color schemes, patterns and tightly edited spaces, all of which is perfectly exhibited in this green, white and gold living room. It's unusual to see two side tables that are actually taller than the sofa arms, but I like the built-in, cozy look that it lends the room....Oh and I would give my right arm for that coffee table. My only complaint? That Tobi karate-chopped the throw pillows. I hate that! Why do people do that?! Fluff, don't chop, I beg you. I love the sophisticated, yet tropical feel of this bedroom. 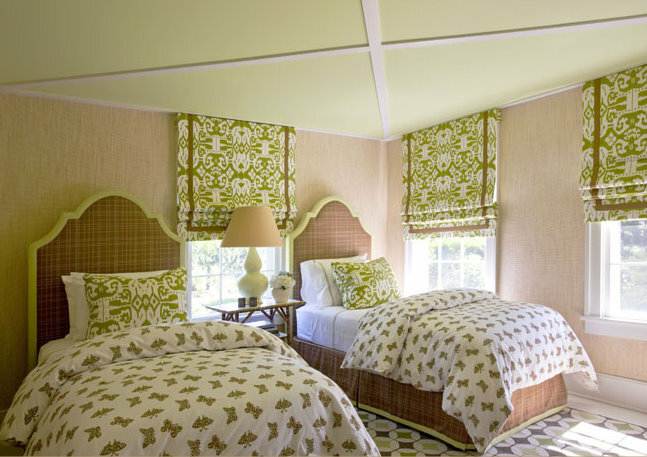 Again, I love the grasscloth wallpaper and its chartreuse hue is a very modern touch against the cottage-style bed as almost any other color green could have read as too country here. 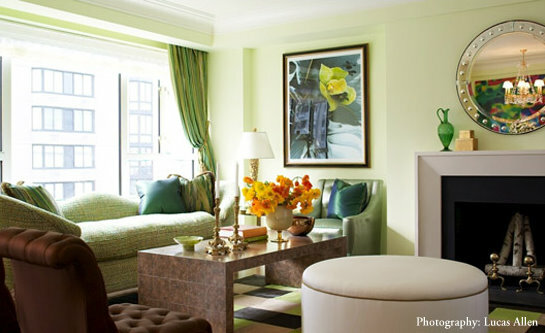 Green is, ultimately, a natural color choice in interior design. It pairs well with both complimentary colors (like pink) and analogous colors (like yellow or blue) and is a great accent color for predominately neutral palettes. 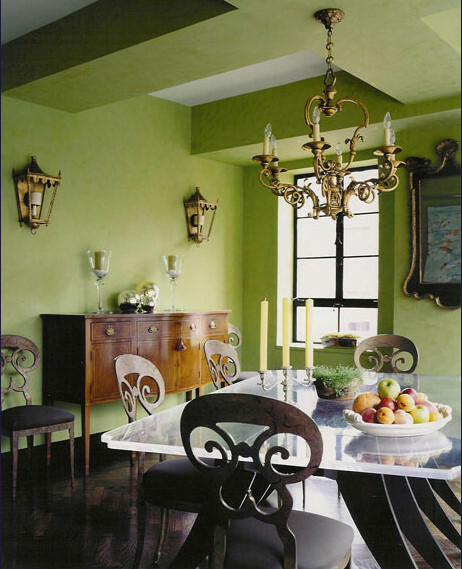 Green can read as energetic or calming, intense or calm, glamorous or laid back. Green also works in a variety of design styles, from traditional to modern. But whichever direction you choose to take green in your design, you can be assured that you'll be bringing in a little bit of Irish luck into your home. Green is probably my favorite color, but haven't used much of it recently. Your comment about karate chopping pillows made me laugh...yes, why is it done? I never really understood until I tried to photograph pillows. I found they are really hard to make look good in a photo, a little chop helps. But it does look a bit silly in real life! I love that wicker settee in the first picture. Actually I love everything in that first photo. 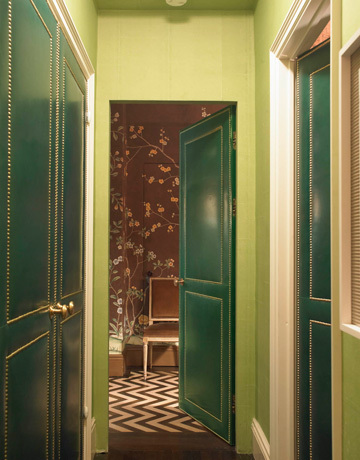 Love this collection of green designer rooms... Braff, Adler, Drake, Howard, etc. All amazing. So many beautiful images! 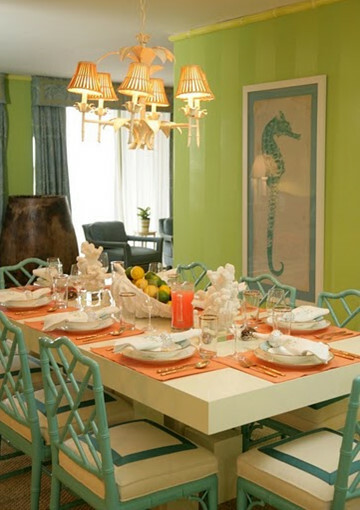 I love the harper dining w the seahorse art.........all of the images you chose are fabulous! Come follow ...art giveaway coming up! PS thank you for always leaving me such nice comments, I love seeing you on my blog!! Oh I forgot one thing, I soooooo Hate the chopped pillow . Who started that? It always looks like they tried to hard and did not quite make it. I agree fluffing is so much nicer.I just saw a room on another blog this morning and said the same thing to myself, I hate that look. I always enjoy your tastefully curated phot collections, Averill. These green rooms are stunning! I'd love to see your Liberty finds - glad to hear the dishes are good quality! honestly that first room stole my heart! i love the green with black.super classic spin on crisp! Love those Harper and Howard dining rooms. A little bit traditional, a little bit tropical. You always come up with the best inspiration pics! That Phoebe Howard dining room is my absolute favorite. Now I'm dreaming about green panels for my own dining room. I change my mind every 30 seconds. I'm a fluffer, not a chopper too! I hate those karate choppers! Great inspiration rooms - the Willey and Fairley ones are my absolute faves - soooo pretty. Hope you had a great day Averill! I'm still slightly obsessed with the Ava chairs too. Love them! First time seeing the Harper dining room and it's fabulous. Thanks for all of the great inspiration. Hope you're having a good night. 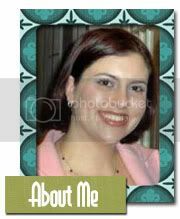 Really like the first Amanda Nesbitt..great post, Averill! Love them all but especially the Adler, Phoebe Howard and John Willey spaces. I never use green in my personal decorating but some of these make me wonder why! Adore your offerings adoring green. Being my favorite color Im mighty happy. And the pillow thing...Im just as perplexed. oh such yummy yummy rooms. It's amazing to me how green can be sort of a neutral in design too. Love it! What an amazing post! I was drooling from start to finish. FANTASTIC collection of green! Many I have never seen. The John Willey with the twin beds...one of my favs/saves too! i love the tobi fairley space almost as much as the way you described her style. something about bold and traditional and tightly edited all in one space. love it and hope you have a happy weekend! Love the black and green in the first photo. I'm also crazy about the chairs in the Phoebe Howard room, which is so fun and preppy. Of course, those Miles Redd doors are to die for. And I totally agree with you about Tobi. So many elements of that room I love--the fabrics, the mirror, the coffee table. I love green as a neutral. Thanks for the beautiful inspirational rooms. Green is my favorite hue - thanks for the great collection! Oooh the Thomas Jayne room is my favorite. Love the shade of green! High versus Low: Pop Quiz Time!